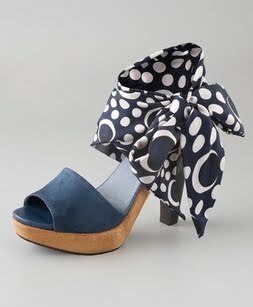 For the Shoe Fetish of The Week, I thought I'd feature these fabulous Diane von Furstenberg sandals. Have you seen them? They're the Flama Tie Scarf Sandal in Marine. They're a suede platform sandal with a detachable print silk tie, so you can wear them 2 ways. Love 'em/Hate 'em? Let me know! Those are gorgeous! Have to get me a pair! Hi! I am your newest follower! Greatly appreciate the follow back. Happy Friday! Welcome April! Thanks for stopping by.